A Polar Bear and the Ice Chunk. There's a little pool near the entrance to the viewing tunnel that still had chunks of ice floating. Unfortunately the path is below the level of the pool so its rather difficult to get good photos. There were some choice moments with this guy poking the ice chunk but alas the D100's buffer was always full or the shot was obstructed. At least I got a few -- this being the best. 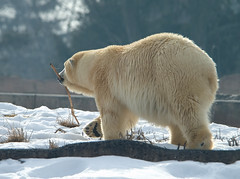 A Polar Bear and his Stick. While this isn't a great photo it was amusing. 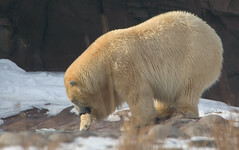 The Polar Bear was just taking the nice stick for a walk.